Johnny had previously broadcast on Radio Caroline during the seventies under the name of Stephen Bishop. 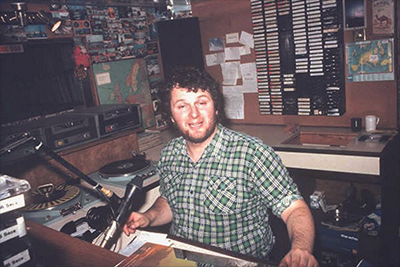 After working on Irish pirates and the Voice of Peace off the Israeli coast, he broadcast again from the North Sea when Laser 558 began test transmissions in January 1984 on 729 kHz. When the station formally launched in May, its on-air team were all American and Johnny wasn't heard again. A few months later he joined Radio Caroline. His first show there was on 12th August 1984 - after a break of 4 years, 5 months, 3 weeks, 6 days, 91⁄2 hours, according to ‘Monitor’ magazine! 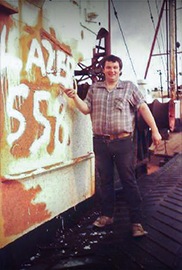 For a while he served as the ship's Captain as well as DJ and being responsible for the home-brewed beer. One of the station's most popular personalities, he left in September 1986. He moved back to the MV Communicator to work as an engineer on Laser Hot Hits and also occasionally presented on the station. He was later on Radio Wyvern, Radio Invicta and KMFM but now trains the broadcasters of tomorrow as well as being heard on Seaside Radio Margate, Coastal Radio, an online community station for Sandwich, Deal and Dover, and the internet incarnation of Radio Caroline. We're delighted to have him back where he belongs: on the good ship Mi Amigo and on AM -Free- Radio, amidst many former colleagues from 'the Golden Era of Offshore AM Radio'. Tuesdays: 14:00 and 19:00 hrs [CET] via SW 6005 kHz and 3985 kHz.